The call schedule generator utilizes specific rules set up by each practice. Physicians/Practitioners can log in and set up their own availability for call and vacation requests. This data automatically is transferred to the call schedule generator with time and date stamps for verification. Whether you are a single institution all physician practice or operate in a multi-institutional team model our scheduling software allows you to keep real time tracking of all your cases. 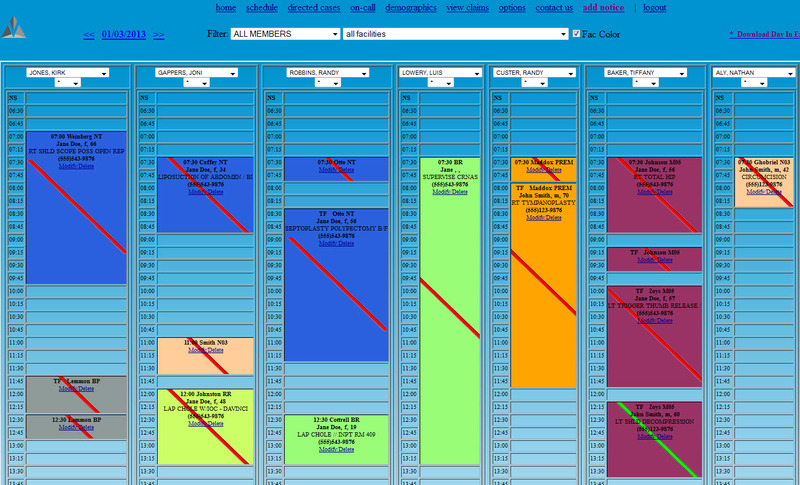 The entire schedule is color-coded based on facility and allows individual practitioners to modify case length, start/stop times, and cancellations. Any intra-day changes automatically generate text messages and emails to all affected individuals, and color changes on the schedule don�t occur until those affected have logged in to see their changes. 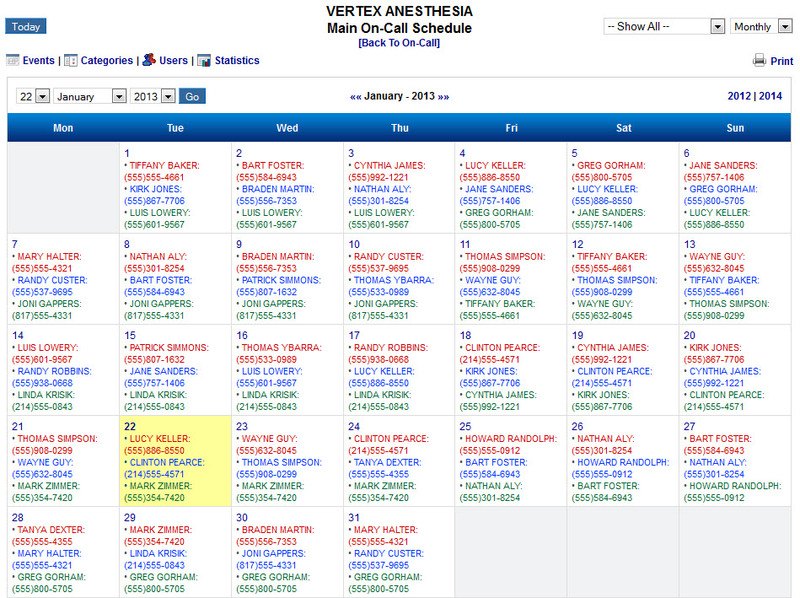 Schedulers also have the ability to send messages to the entire practice from the scheduling page. Individual case indicators are colored slashes: Green: case started, Red: case complete, Purple: major case modification (i.e. significant length change indicated by a pop up message seen when mouse floats over affected case). Case data displayed depends on length of case, but even short cases will have full data available in a pop up window when mouse floats over case. All schedule data is stored on a secure server and is a completely searchable database with multiple parameters to provide the most specific data a practice desires. All schedule info is also available on the iphone and android applications. Finally, all case data entered into the scheduling system then pushes to the charge capture piece to streamline data entry for that portion. If a practice is utilizing the entire software suite, all previously entered schedule data is transferred to the charge capture application and auto-fills most charge data. 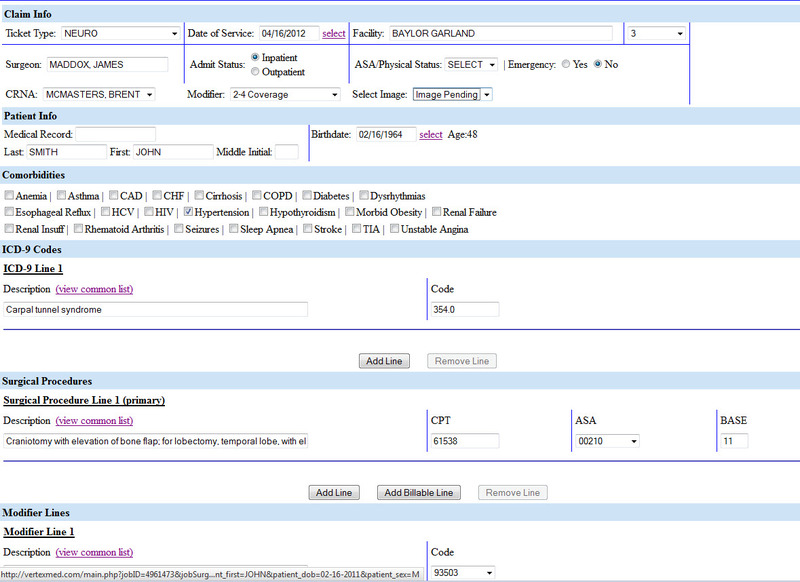 The ticket type chosen by a practitioner filters down to further limit ICD-10 and CPT choices. The software is designed to be used in conjunction with either the iphone or android applications. This allows individual users to log in and access any scheduled cases and capture digital images of demographic sheets, H&P/pre-op data, and anesthesia records. These images will be stored on the secure server and then automatically coupled to the charge submission for each case. 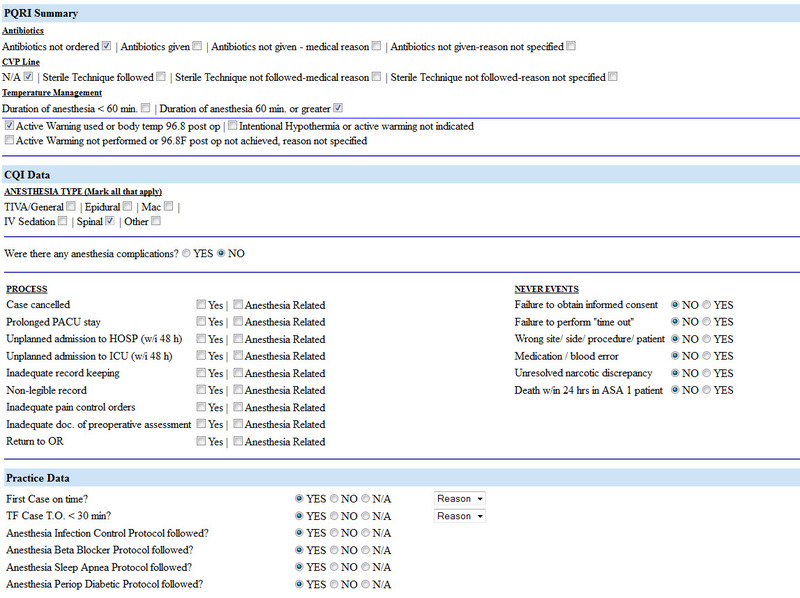 The software also guarantees compliance with all PQRI demands and assists in Clinical Quality data collection. It can be programmed to sync with the AQI and also allow tracking of practice data including on-time starts and other clinical data. V.O.S.S. will also interface with existing billing software and if possible existing hospital software to pull scheduling and demographic data. Coupled with the online version of VOSS software are mobile apps for both the iPhone and Android devices. This app allows users to log on to the server and see all of their cases (whether scheduled, pending, or cancelled) and modify the progress of their cases from their device. It also has image capture that will allow the practitioner to takes picures of the demographic sheet and up to 10 other anesthesia case related items (i.e. pre-op, anesthesia record, TEE report, procedure note, etc) and then link these images to the charge capture piece that is sent to the billing company for future verification needs.